With a colorful spread of food, strong Turkish tea, and live music, Nazif's is the place to be on Sundays. The first of many plates you'll fill up and empty at Nazif's during Sunday brunch. 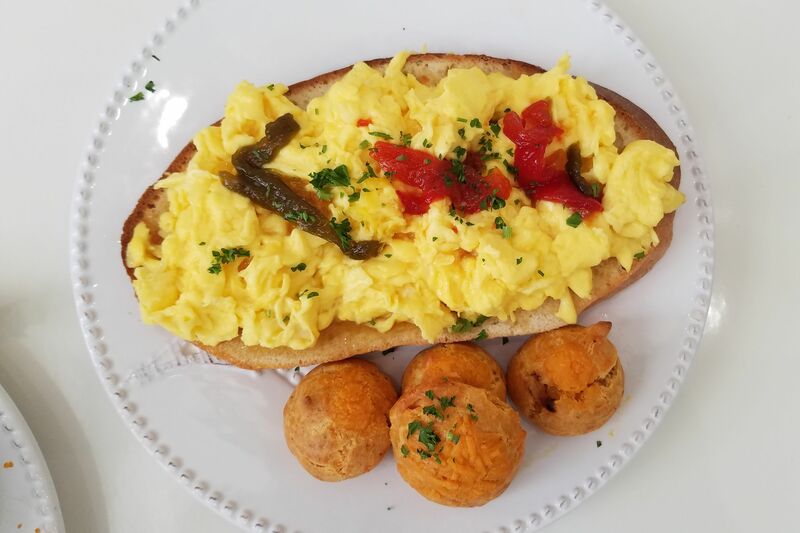 The first thing you need to know about brunch at Nazif's Turkish Grill and Deli is that you'll need to arrive early. 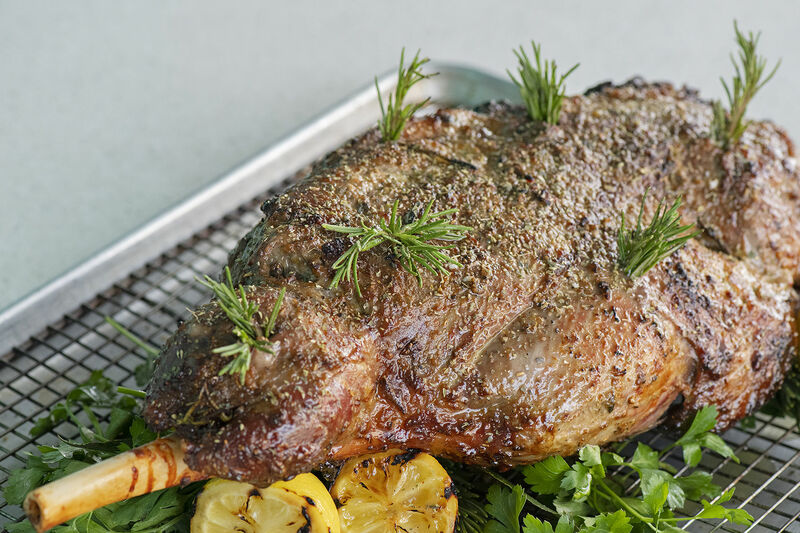 Sunday is the only day of the week Nazif's offers the meal, and the only day that the Turkish cafe at Westheimer and Fondren opens at 10:30 a.m. The rest of the week, Nazif's turns out traditional Turkish lunches and dinners like lahmacun (flatbread pizzas), pide (the tastier cousin of the calzone), and doner kebap (grilled, skewered meat). 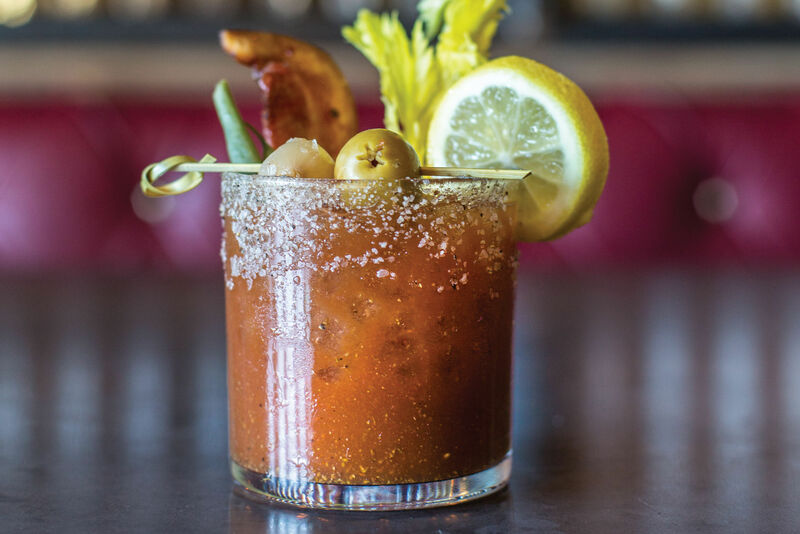 But you won't find any of the brunch items on its regular lunch and dinner menus. And if you arrive too late, you won't find a seat: by noon, the small dining room is typically filled with Turkish expats. 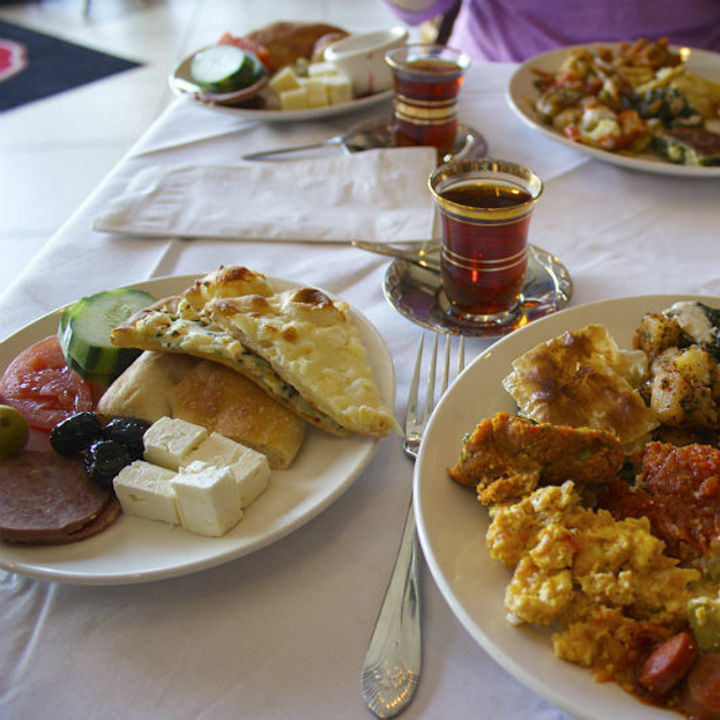 The second thing you need to know is that unless you bring along a Turkish friend, you're not going to recognize a single thing on the vast brunch buffet except for cheese, tomatoes, cucumbers, and olives—all the traditional snack-y accoutrements that accompany a big Turkish breakfast. The rest of the buffet is a colorful carpet of dishes rarely seen in Houston, even at our other Turkish restaurants like Istanbul Grill, Pasha, or Empire Turkish Grill. Moving on down the line, you'll find ezme, that traditional spicy "salad" made from tomatoes, peppers, and walnuts, but you'll also find more unusual dishes such as börek (imagine Greek, spinach-stuffed spanakopita on steroids), saksuka (marinated eggplant and red peppers in a thick, garlicky yogurt sauce), and etsiz çi köfte (patties made from ground bulgur wheat, tomato paste, and spices—a dish whose name literally translates to meatless meatballs). 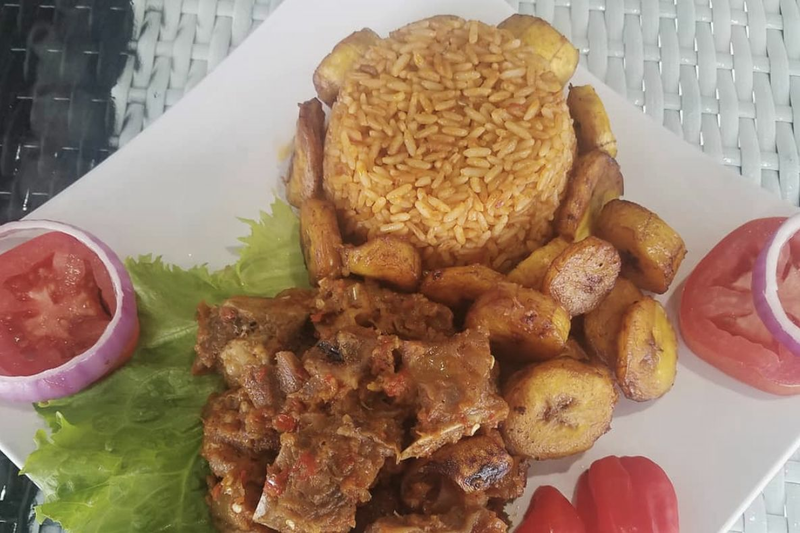 If you don't know what something is, don't be afraid to ask the genial owner, Nazif Farsak, who's always walking the dining room in wire-rimmed glasses, checking on tables and eager to offer guidance on his native cuisine. It's not difficult to identify the sheep's milk cheese, beef sausages, butter, honey, and homemade jams at the end of the buffet, however, all of which are terrific with that soft bazlama bread. 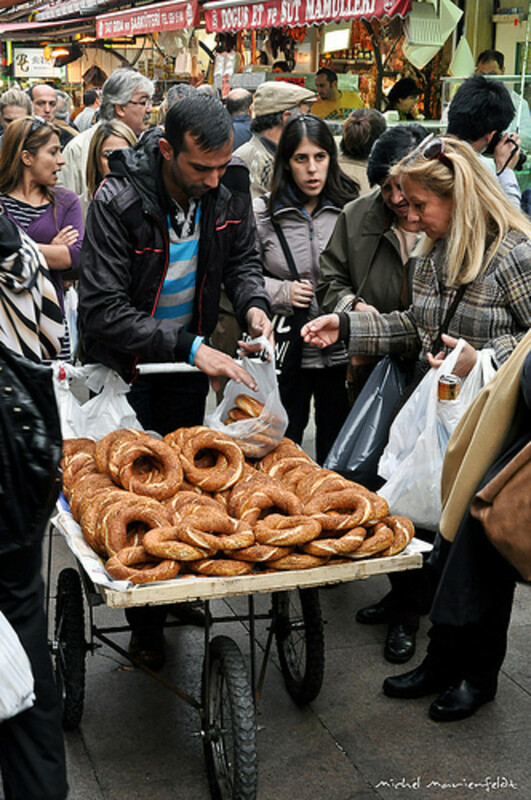 A simitçi (simit street vendor) in Istanbul. 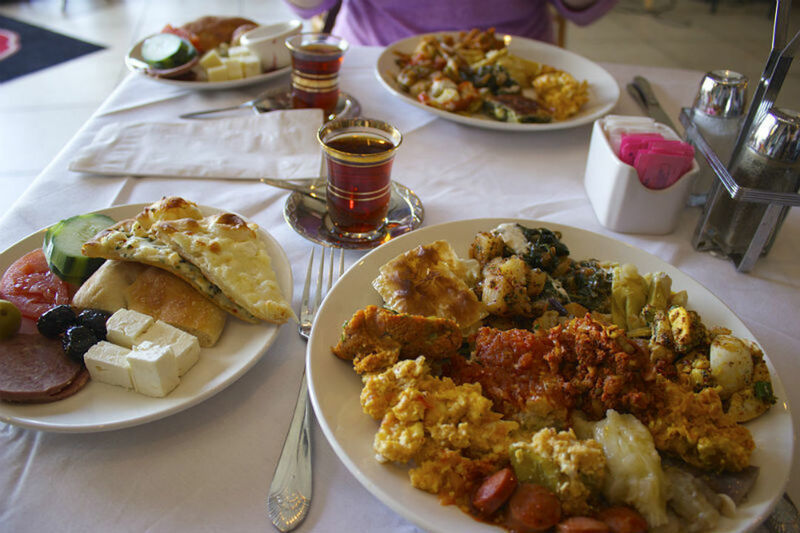 The Sunday brunch buffet is only $14.95 and it's all-you-can-eat, which partly explains why large Turkish families occupy their tables for hours at a time. A friend who'd just returned from living in Istanbul pronounced the place as authentic as you'd find in Houston, right down to happy, tousle-haired kids running from table to table as though each Sunday morning were just a giant family reunion. Adding to the atmosphere is the sunny, sparkling-clean dining room with the feel of a nice hotel in Istanbul, as well as live music performed by a two-man Turkish band that's loud enough to be festive but still quiet enough for conversation. And as with every meal at Nazif's, unlimited cups of chai—strong, black Turkish tea—are free. One final thing to note about Nazif's: if you get there in time to get a table, order a plate of simit immediately. The popular breakfast pastry is one of the most traditional Turkish breads, formed into a round ring larger than a bagel and covered with a dark dusting of sesame seeds. Nazif's bakes its simit fresh each Sunday morning in its huge wood-burning oven, but the pastries always go fast and are usually sold out by noon. Don't say I didn't warn you. $$$ Mediterranean 8821 Westheimer Rd.